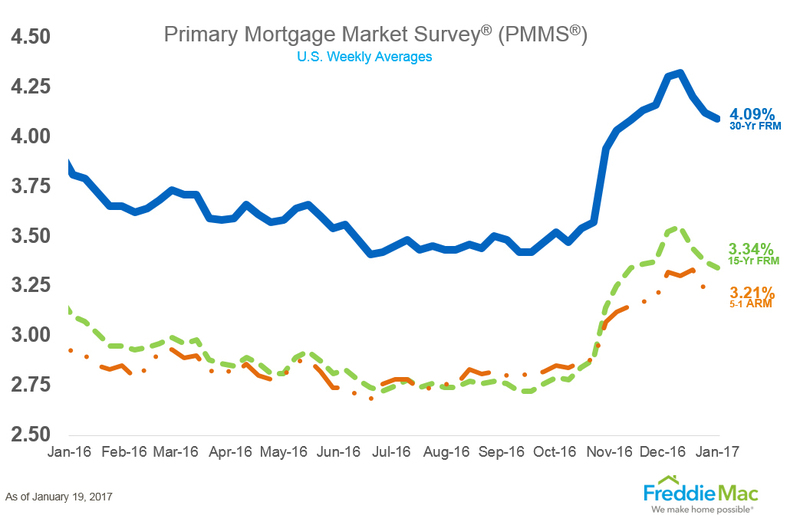 The 30-year fixed-rate mortgage averaged 4.09 percent with an average 0.5 point for the week ending Jan. 19, 2017. This is down from last week when it averaged 4.12 percent. A year ago at this time, the 30-year FRM averaged 3.81 percent. Privately-owned housing units authorized by building permits in December were at a seasonally adjusted annual rate of 1,210,000, 0.2 percent below the revised November rate but 0.7 percent above the December 2015 estimate. Privately-owned housing starts in December were at a seasonally adjusted annual rate of 1,226,000, 11.3 percent above the revised November rate and 5.7 percent above the December 2015 rate. Privately-owned housing completions in December were at a seasonally adjusted annual rate of 1,123,000, 7.9 percent below the revised November rate but 8.7 percent above the December 2015 rate. Mortgage applications increased 0.8 percent from one week earlier for the week ending January 13, 2017. 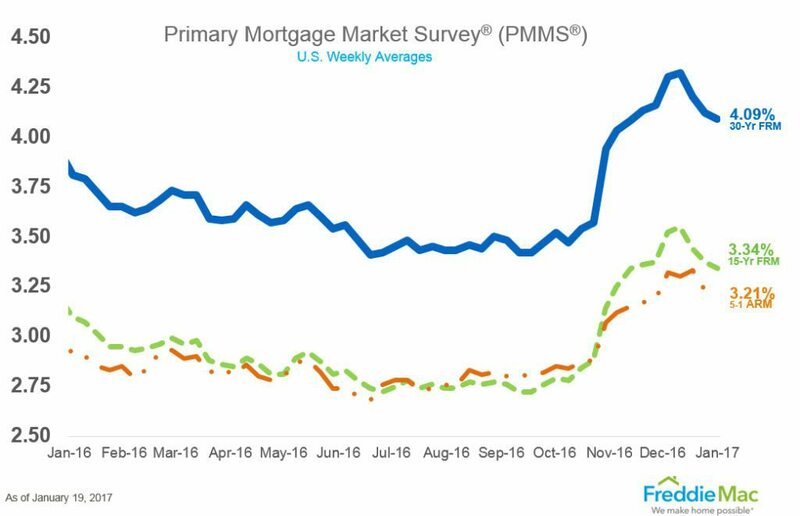 The refinance share of mortgage activity increased to 53.0 percent of total applications from 51.2 percent the previous week. The average contract interest rate for 30-year fixed-rate mortgages with conforming loan balances decreased to its lowest level since December 2016, 4.27 percent, from 4.32 percent. The median sales price of $216,000 was 4.9 percent above one year ago and 1.8 percent below November’s. Inventory declined 17.9 percent year-over-year in December. The average days on market of 62 was the lowest of any December in the report’s history.